One of the best things about life in Budapest is the neighborhood food markets. 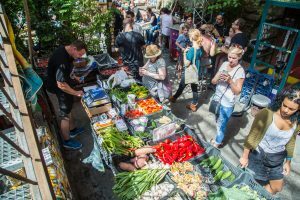 Beyond the main market halls found in most districts, there are more and more groups starting farmer’s markets, and shopping at weekly farmer’s markets like the one at Szimpla Kert is how I wish I could spend every lazy Sunday morning. But even though the Central Market is Budapest’s largest market and one of the city’s top tourist attractions, every time I head across the Danube from my apartment in Buda to shop there, I am still thrilled by the experience and delighted by the bountiful selection spread out over the market’s three levels. 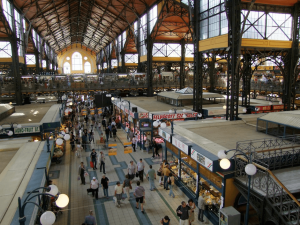 Though the market hall is one of Budapest’s top monuments, the market is not just for tourists. It’s a place where locals shop daily, and nurture relationships with their favorite vendors over many years. Architecturally it is a protected city monument, and is one of Europe’s finest market halls. It is an airy orange and yellow brick building, full of steel beams and light flooding in through enormous windows. 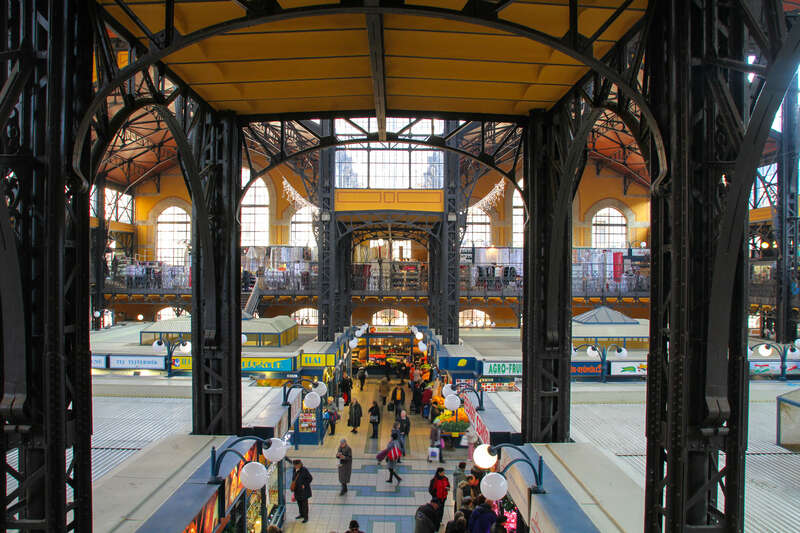 With its cavernous interior, the vast three-level market hall should be a spot of pilgrimage for any food-lover coming to Budapest—a place where you can spend hours browsing, shopping, snacking, and meal-planning. 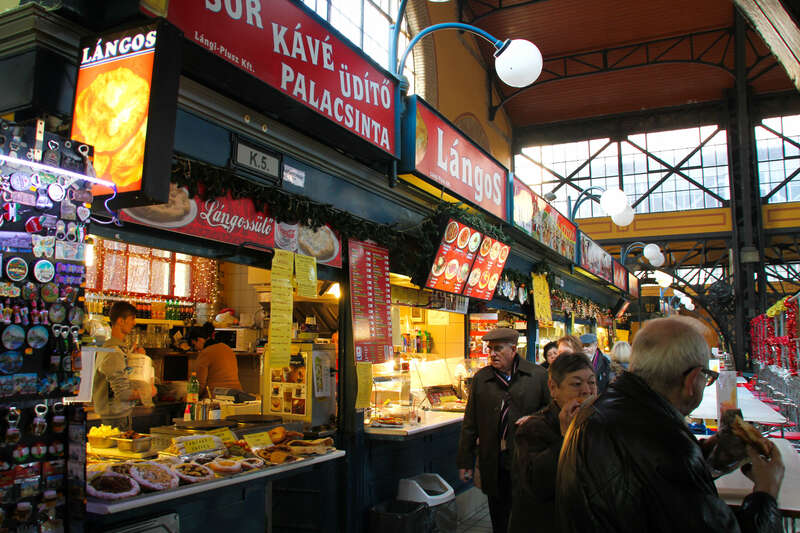 One of the original reasons behind the construction of this market (and the smaller versions which are located in other districts) was to improve food quality in rapidly growing late-19th-century Budapest. In the summer of 1897, after two years of construction and with the building less than two weeks from being finished, a fire tore through the place and set completion back until the following year. When it finally opened, the market became an import-export center and an important source of food supplies for both Budapest and the rest of Hungary. 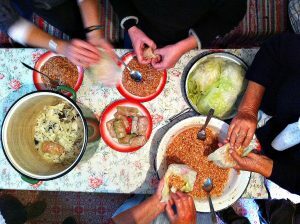 Strict rules were set up to maintain high quality. In the early days an aisle for wagons ran through the center, with retailers on the east side and wholesalers on the west. The market was severely damaged during World War Two and was hastily repaired after the war. By 1991 it had fallen into such disrepair that it was deemed too dangerous to use and was closed until 1994 for a thorough restoration in which even the old roof tiles were replaced by exact Zsolnay replicas. The main ground level holds all of the produce vendors and most of the butchers. 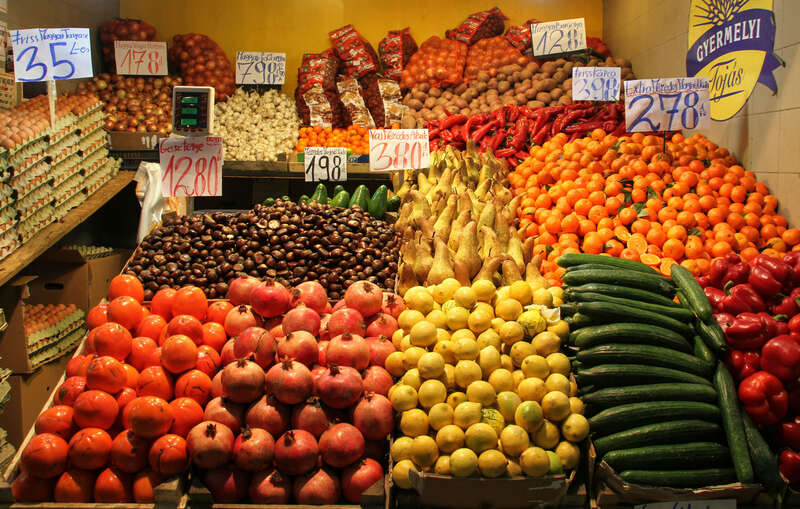 The left aisle mostly stocks straightforward fruits and vegetables, while the sellers along the right aisle mix in more exotic imported produce. 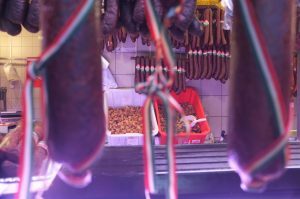 The dozens of butchers call out to potential customers as they walk by, in an attempt to persuade them that their kolbász is better than their neighbors’. You’ll catch whiffs of sauerkraut and vinegar as you descend into the basement where the fishmongers and a clutch of vendors selling pickled vegetables are located. There’s also a selection of game down here, as well as a kiosk selling cheap kitchen utensils. Big wooden staircases in the center lead to the upper level, where there are stalls selling sausages and lángos. At the borozós (cheap bars), customers down shots of Unicum accompanied by shoddy wine. Most of the upper level is devoted to selling the mostly mediocre (Chinese-made) folk art and knick-knacks. Foie Gras. 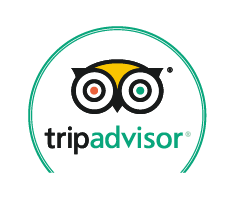 This is the place to come for fresh chunks of creamy duck or goose liver, a Hungarian specialty. Take it home and cook it simply in its own fat, sprinkled with some salt and paprika, like the locals do. Mushrooms. I nearly always make a beeline straight for the very rear section on the ground floor. You’ll walk through the mushroom display cases (in which we can see which local varieties are edible or poisonous), and when the season is right for mushrooms you will find foragers with tables piled high with them. You’ll find an array of mushrooms depending on the season, including morels, chanterelles, and porcinis. The small farmer’s market in the back. 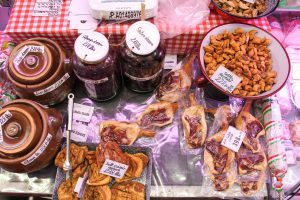 Here you’ll also find small producers and growers with their produce displayed on wooden tables. During the colder months they come less frequently, while during the growing season they come almost every day. In addition to fruits and vegetables, here you can often find hand-produced jars of jam and honey, egg noodles of all shapes and sizes, and homemade juices and syrups. A dairy stand sells raw milk, homemade cheeses, sour cream, and butter. The Steak Shop. There aren’t a lot of places in this town to find a good quality steak, and this is where I usually buy mine. 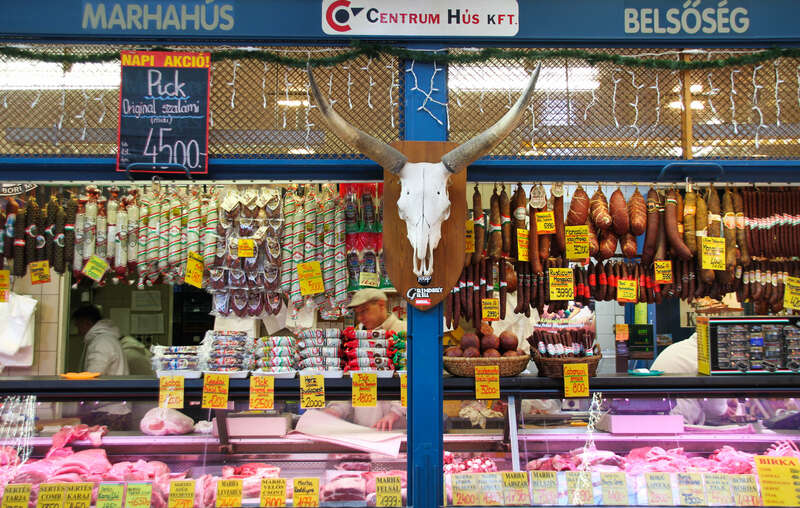 In addition to both local and imported steak, they sell top-quality cuts of other meats and sausages. Pickles. You’ll smell the pickles before you actually see them. The pickle stalls crammed into the lower level are so artfully-arranged that I often can’t resist buying a selection of them. Many of the families who run the pickle businesses down here have been doing it for generations, and grow their own vegetables. Most of them have their workshops in Vecsés, a small Swabian town just outside of Budapest which has strong pickling traditions. 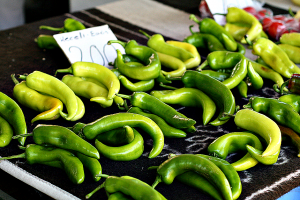 They pickle practically anything, from baby watermelons and plums to peppers and cauliflower. Seasonal fruits and vegetables. Obviously. There is a fantastic selection here. All of the signs, helpfully, tell you where they are from (the country if they are foreign, and usually the town/county if they are Hungarian). Coffee. By this time you may need to be caffeinated. If you’re standing at the beginning of the center aisle, walk straight and take your first left. 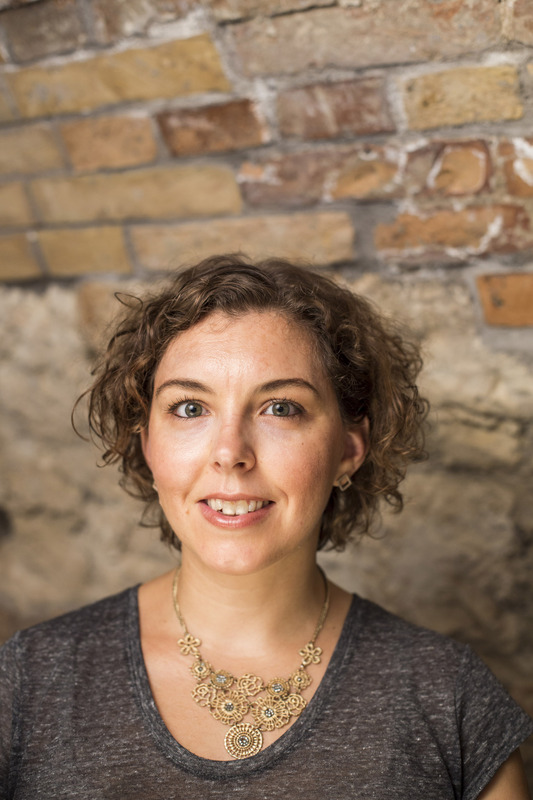 You’ll most likely see a line outside of a tiny window, where little glasses of dark, strong coffee are served. Coffee cannot get more retro than this. A bargain at a little more than 100 HUF for an espresso, drink it there or get it in a plastic cup to go. 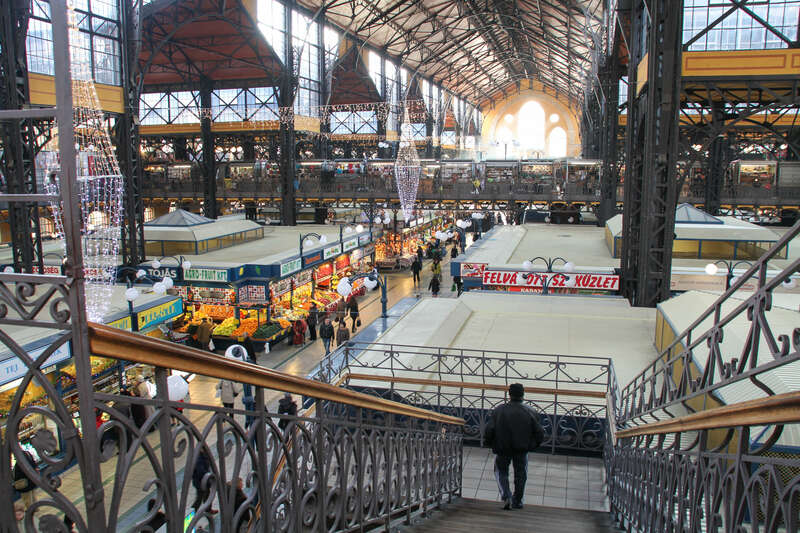 Explore the Central Market Hall (among other stops) on Taste Hungary’s Culinary Walk!